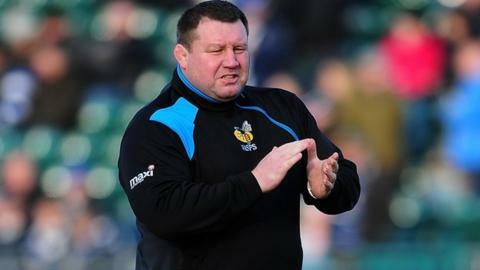 Wasps director of rugby Dai Young says the task now facing his side is to maintain the standards they have set over the last few weeks. After losing two of their first three Premiership games, Wasps have now won back-to-back European Champions Cup pool games, capped by their impressive 32-6 win on Sunday over holders Toulon. "The players have set the bar quite high," said 48-year-old Young. "The challenge for us is to maintain those levels of performances." Wasps' bonus-point victory over three-times champions Toulon followed a 33-6 win in Dublin against Leinster to give them an almost perfect start to their European campaign. And Young said he had observed an uplift in his players' confidence as a consequence. "It's been a bit of a rollercoaster start to the season, but the passes are now sticking when, in the first couple of games, they weren't," he told BBC Coventry and Warwickshire. "We want to play and get the ball in hand and it wasn't quite clicking for us, our defence wasn't where it has been and our ball handling and retention was poor but we've improved that and reaped the benefits. "Certainly over the last three to four weeks we've started to look more like a team." Wasps return to domestic action against winless London Irish as part of Saturday's double-header at Twickenham, which also features Saracens against Worcester Warriors.